Adelle Tracey, one of the talented singers who make up Stadia, lights the Olympic Cauldron at the Opening Ceremony with six other future Olympians. Pictures to follow. Listen to an interview with Adelle here. Greg James played a snippet from Refuse to Lose on Wednesday 26th and Thursday 27th July and has commented on the song on his Twitter page. Check out the Soundbites page to hear what Greg had to say about Refuse to Lose and Stadia. The interveiw is also feature on Spirit FM's website here. Below is an extract from Spirit's website. It comes as a music producer in West Sussex writes a song he hopes will inspire future generations during the year Britain hosts the Olympics. Robin Mayhew wrote 'Refuse To Lose' a few months ago so kids could sing it on the last day of term - one week before the Games begin. They're able to download the words and music from his website. With young people watching shows like X-Factor, he hopes it's a good way to get them believing in themselves like our top athletes - but is discipline missing in the classroom? "I believe it is to an extent. I'm not going to say everybody is suffering from that, but I do believe discipline in our schools and all the rest of it, may be one of the problems which is causing some of our younger members of society to become a bit flakey. This may help some of them to achieve." Local singer Kit Bradshaw is one of those on the track: "I see it as a way in to showbiz so to speak. I think 'Refuse to Lose' as a concept has a great meaning and sense of purpose to people in all walks of life." 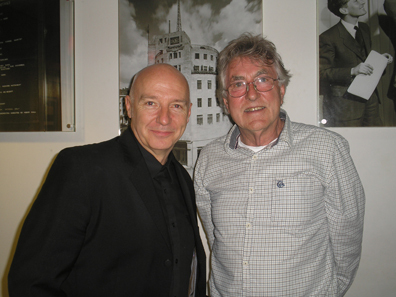 May 21st 2012 - Robin with Midge Ure at the BBC London during an interview to celebrate the 40th anniversary of the release of David Bowie's album The Rise and Fall of Ziggy Stardust and the Spiders from Mars. Robin was responsible for the front of house sound for all the live shows. Nick Gibb MP wishes us success with Refuse to Lose. Click here to view a copy of his letter. Vocal scores for all parts now available for download from the Event Page. Click on the link below for an article published in most West Sussex papers last Thursday 1st March 2012. "Thousands of voices for Robin's Olympic anthem"
The Refuse to Lose dance moves are now available from the Event page and have been published on YouTube. Click here view the moves. The PRS 'M' On Line Magazine feature Refuse to Lose and interview. Guildford is one of 66 evening celebration locations across the UK confirmed by the London 2012 Organising Committee of the Olympic and Paralympic Games (LOCOG). Adelle Tracey, one of the lead singers in Stadia has appeared as a potential Olympic torch bearer on the Guildford Borough website. On Friday 20 July 2012, we will host the last Olympic torch celebration before it makes its way to London. The final route of the torch, and how it will get between the celebration locations, is still being planned and will be announced by LOCOG later this year. We will then know where in the borough the torch will travel to get to Stoke Park for the evening celebration. This event will offer thousands of local residents and visitors the opportunity to share in the Olympic spirit. We are now planning the celebration with our partners and want to involve our local community as much as possible. Guildford already has a proud Olympic legacy from the London Games in 1948, when the torch last made its way through the borough. We hope that future generations will look back on 20 July 2012 as another historic day to remember for everyone involved. The latest information on the Torch Relay Route and celebration in Guildford and other local Olympic news will be available here. Please visit the London 2012 website for more information on the Olympic Torch Relay and the nomination process for local torch bearers. 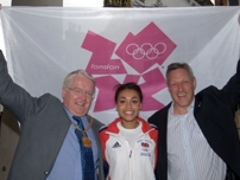 Image right (left to right): The Mayor of Guildford, Cllr Terence Patrick; Adelle Tracey - local Olympic future talent; Allan Wells MBE - Olympic gold medal winner. We have been invited by the Creative Programmer for the South East to apply for the Cultural Olympiad 'Inspire Mark'. The song was released on October 16th 2011 and an invitation will be sent mid January 2012 to all schools, academies, colleges and dance groups to take part in an event which will be synchronised and happen on the 20th July 2012 at Twenty past Twelve pm (Twenty past Noon). If everything goes as planned it could be the biggest event of its type ever undertaken plus the ethos of the lyric will spark a positive spirit in support of our Summer Olympic Games athletes and, most importantly, all those young people that sing the song will hopefully carry its words with them for ever. . Check out the Inspirational Sunchronised R2L Event page for full details. Also check out Ahead of the Game for local West Sussex action taking place prior to the Olympic Games.